We all do better when we work together. That’s the lesson teachers and support staff in the North Branch Area Schools learned from the district’s first successful referendum campaign in at least 15 years. And it was a valuable lesson, as voters in a special election May 23 approved all three of District 138’s funding requests, worth a combined $70 million for repairing the district’s facilities, updating classroom technology and building new gym space. The successful “Vote Yes” campaign broke a streak of at least seven consecutive failed attempts to inject new funds into the North Branch Schools. But none of those referendum campaigns benefitted from the labor-community partnership educators, working through their local unions, built this time around. The spirit of cooperation proved contagious. Working together helped the NBEA and the North Branch Support Staff Association draw support from their statewide union, Education Minnesota, as well as the Chisago County Labor Assembly and the St. Paul Regional Labor Federation – support that meant resources, political expertise and volunteers. The RLF hosted biweekly phone banks out of the St. Paul Labor Center throughout April, and RLF political staff helped recruit volunteers for door-knocks and phone banks on the ground in North Branch, urging union members who live in the district to support the referendum. 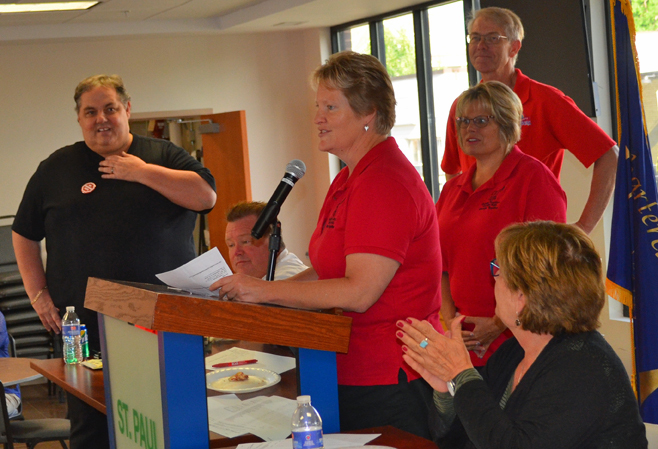 The RLF is based in St. Paul, but the federation represents workers in four counties – Ramsey, Washington, Dakota and Chisago – and hosts monthly meetings in each county to engage rank-and-file union members in local issues and campaigns. Beebe, who coordinates the RLF’s Chisago County Labor Assembly, said the victory in North Branch speaks to the power of belonging to something bigger. The real winners, of course, are students in the district, which will no longer have to rely solely on its general fund to maintain and modernize its facilities. The impact of solidarity, Kasper said, showed up in the increased voter turnout May 23, compared to a failed referendum campaign in North Branch just one year earlier. The number of voters jumped from 2,207 to 2,976.